Vamshi Krishna, a CA student from Guntur who attended Modi’s meeting, said he was disappointed as the PM left without giving any assurances for the state. The ongoing fight between former allies, the ruling Bharatiya Janata Party (BJP) at the Centre and Telugu Desam Party (TDP) in poll-bound Andhra Pradesh has increased the political momentum in the state in the run-up to the 2019 elections. With months to go for the state and general elections, Prime Minister Narendra Modi lit the poll fire with his address at a ‘Praja Chaitanya Sabha’ (Public Meeting) in Guntur on Sunday. Narendra Modi in a scathing attack on TDP supremo and Andhra Pradesh Chief Minister Chandrababu Naidu called the latter's regime as one with 'corruption and dynasty politics'. Modi's visit to Andhra was the first after the BJP and TDP fell apart in March 2018, with Naidu’s party pulling out of NDA citing non-accordance of Special Category Status (SCS) and failure to implement bifurcation promises. The Prime Minister trained his attack on Naidu and his son and IT Minister Nara Lokesh, calling the Andhra government ‘baap-beta sarkar’. Modi said that Naidu has been taking U-turns for the sake of power and joining hands with the Congress though NTR has established the party for seeing 'Congress-less politics'. "From fighting the ‘Dushta’ (evil) Congress under the formidable NTR garu to becoming a ‘Dost’ (friend) of Congress, the TDP has come a long way in Chandrababu's leadership," Modi said. The whole uproar between the two parties is about funds allocation for multiple projects in the residual state of Andhra Pradesh. While TDP is accusing the BJP of not giving what the state deserves, the latter is claiming that the state government has misused the funds though they have been provided with enough. “Though the assurances and projects can be fulfilled in 10 years as per the AP Reorganisation Act, 2014, we have done most of it in the last four years," Modi said, stating that 10 out of 11 central institutions had been granted approval. 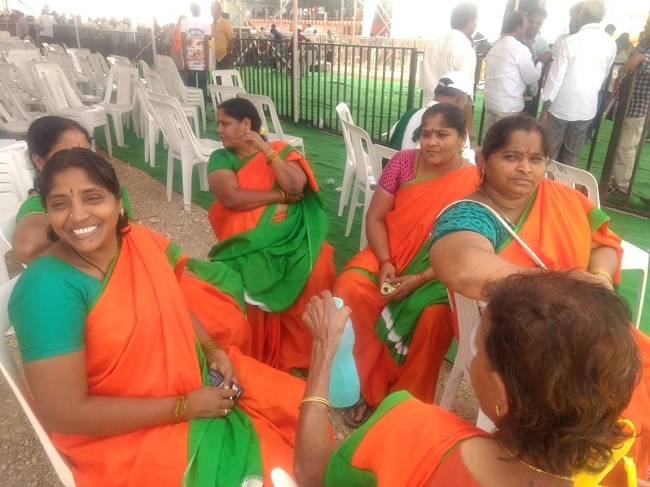 Though Modi didn’t make any concrete promises except that his government would work for AP’s developments, his rally has boosted the morale of the BJP cadre on the ground. Inapudi Sreedevi, Women Wing leader of BJP speaking to TNM said that the meeting was successful despite the disturbances by TDP government. “If there were no obstacles created by police authorities, there would have been more presence of people. This is a grand success meeting and will boost our strength in exposing the TDP’s lies," she said. B Subba Rao and D Veera Raju, two farmers in their late 50s, from Mudinepalli village, said that Modi's speech had countered the TDP's allegations well. BJP MLC and senior leader PVN Madahav said that the meeting was a big success and the clear clarifications by Narendra Modi have exposed the lies of the TDP. Madhav said "This meeting will definitely help us to counter the malicious campaign of the TDP against the BJP government". Reacting to Modi’s scathing attack on him, Naidu however said that the BJP leaders should understand the ire of the people towards the Central government, which failed to fulfil state bifurcation assurances. Speaking at a public meeting, Naidu responded to Modi's interpretation of the ‘Go Back Modi slogan’ as ‘Go Back to New Delhi’ (and get re-elected to power) by saying, “We are asking you to go back to Gujarat and to your village. It doesn't mean that you will get elected as PM again. You don't have the eligibility to be a PM," he said. While the BJP and TDP are busy trading barbs, the people on the ground seem to be finding themselves disillusioned with the claims made by both groups. Vamshi Krishna, a CA (Charted Accountancy) student from Guntur who attended Modi’s meeting said that he was disappointed as the PM left without giving any assurances for the state. Murali Krishna, a farmer from Guntur’s outskirts who travelled several kilometres to where BJP's meeting took place, claimed that he came out of interest to know who is speaking what ahead of the elections. He, however, added that people like him are certainly delighted to know certain facts that contrasted the TDP's claims. 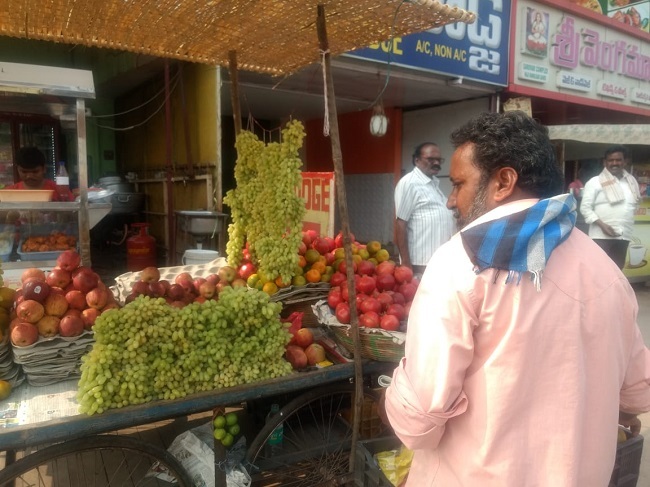 Shaik Munna, 50, a fruit vendor in Guntur when asked about the PM's tour to his town, said that he came to know that Modi was coming since elections are ahead. In a brief conversation, Munna said that he doesn't bother to believe either of the groups about funds allocation and Special Category Status (SCS) to the state. "What will we get if we get the Special Status? Do our lives change with this? No one will do anything. Everyone wants to loot since they luckily got into power,” he said. While several people blamed both parties for not doing enough, many also said that they did not want to comment on the political showdown in their city as they believed that it was just a common stunt for political parties ahead of elections.